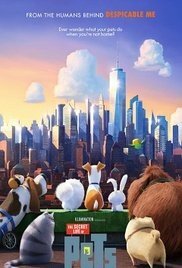 After grossing over $324 million dollars worldwide in the first two weeks of its’ release, how can you not label THE SECRET LIFE OF PETS (2016) starring Louis C.K., Eric Stonestreet, and Kevin Hart as anything but a financial success? Now factor in a production budget of only $75 million dollars, and you can already hear the script writers knocking over their chairs in a frantic attempt to bang out a sequel. Not the kind of movie that will endear itself to you as THE LION KING (1994), or MONSTERS UNIVERSITY (2013) managed to do, this latest 3D computer-animated children’s story will still provide a satisfying afternoon of family entertainment. A terrier named Max is living a good life in a Manhattan apartment when his owner Kate unexpectedly brings home an enormous, fluffy-haired stray named Duke. Within a second, Max dislikes Duke and resents the extra attention his owner is lavishing on the newest member of the family. After Duke employs a countermeasure and pulls Max deep into the city, the dogs quickly realize that they’re not prepared for what they find. Watching this movie with my two grandsons reinforced the fact that every child wants a dog, however, as the film progressed, I couldn’t shake the feeling that something was vaguely familiar about this plotline. Halfway through, it was really starting to bug me, when I finally realized that the theme of privileged ownership by a coveted human was so familiar for good reason. This was TOY STORY (1995) reworked with pets! Even the Flushed Pet’s attitude toward humans so strongly reminded me of the Lots-O Huggin’ Bear in TOY STORY 3 (2010) that I found myself sitting straight up in my seat, scanning the theatre to see if anyone else had made the connection. Obviously borrowing heavily from a tried-and-true plotline, THE SECRET LIFE OF PETS (2016) will definitely appeal to most audiences. Directed by Yarrow Cheney and Chris Renaud, Rated – PG, 87 Minutes, Animation, Comedy, Family, Released July 8th, 2016. *** 3 stars out of 5.